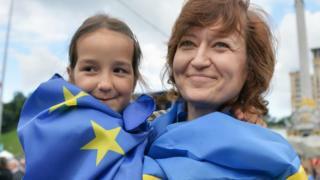 A Dutch referendum is to be held on an EU agreement for closer relations with Ukraine, after 427,000 people backed a citizens' initiative. The No Poll movement is taking advantage of a new law allowing advisory referendums. The Dutch parliament had already backed the EU deal, which removes trade barriers between the EU and Ukraine. But campaigners fear that it could be a step towards EU membership and would cost Dutch taxpayers billions of euros. "This is a chance to say we're here too," says Eurosceptic Thierry Baudet, who argues that Dutch voters should have their say on policies such as EU expansion, legislation and aid packages. In particular he says the treaty would enable Ukrainians to travel without visas across Europe when their country is in conflict with Russia. Ukrainian President Viktor Yanukovych triggered months of unrest in Ukraine and eventually his overthrow when he pulled back from signing the EU Association Agreement in November 2013. Since then, Ukraine's new government has signed the deal and parts of the treaty have provisionally come into place. The trade part of the agreement will come into provisional effect on 1 January 2016, but will not be fully in force until all 28 EU member states ratify it. Six countries have yet to do so. "A very big part of the agreement such as political dialogue on financial co-operation [will come into effect] but not everything," a spokeswoman told the BBC. Under the new Dutch law, which requires 300,000 signatures to trigger a vote, the referendum has to take place within six months. Although the result will not be binding on the government, it will have to be considered if turnout is above 30% and a majority votes against the agreement. Jan Roos from No Poll ("GeenPeil" in Dutch) said it was vital for turnout to go above 30% as it would then be "hard for the cabinet to again ignore the voice of the people".